NEWCASTLE area Counncillor Willie Clarke (Sinn Féin) has made representations to Down District Council Building and Estates department in relation to maintenance issues at Newcastle Harbour. Speaking to Down News, he said: “I recently inspected the North Pier and found the surface to be in really poor condition, it is heavily pot holed and covered in weeds. I will be seeking a meeting with senior officers from Building and Estates to improve the situation. 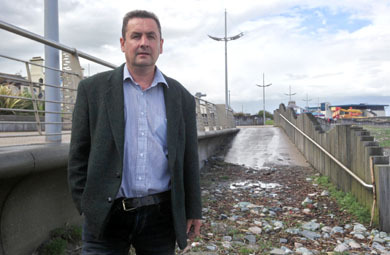 Newcastle Councillor Willie Clarke has expressed his concern at the state of the harbour and shore area in Newcastle. “This is another example of neglect at the Harbour area; this area has been allowed to fall into a state of disrepair and is not a priority with Down District Council. The harbour area has a real feel of dereliction and neglect about it, and while we have regeneration master plans completed in 2007 and 2011 that continue to gather dust, these reports highlight what works should be carried out. There appears to be no urgency from Down District Council to implement the recommendations in these reports. “For too many years the Harbour area has received little or no funding which is in stark contrast to other coastal communities. Council have a fundamental duty to ensure there is adequate resources directed to the Harbour which is in their ownership, not just for tourists but for the local people alike to enjoy recreationally. 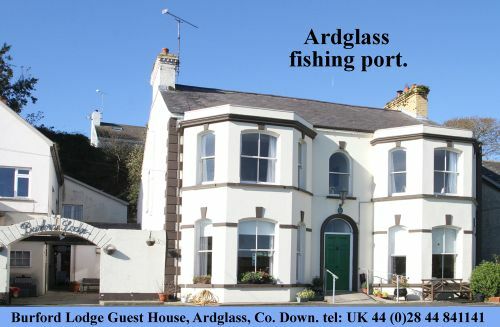 “The enhancement of the derelict buildings illustrated that a small amount of funding received from the department of the Environment dereliction fund improved the image of the built heritage at the Harbour, this is a good example of what can be achieved with finite resources. “Now is the opportunity for all interested parties to get together and actually focus on what can realistically be achieved in the short-term and what is really possible in the long-run. Council officers have indicated that the only funding that will be available to renovate the Harbour will be a future tranche of European funding, which will not be available for 18 months. In the interim period it is unacceptable for Council to do nothing to improve the image of the Harbour. Council must find the resources to restore the surface of the North Pier.